At The Special Low Re-launch Price Now! The name alone is magic. Is there any guitarist alive who doesn’t sit in absolute, open-mouthed wonder when watching a clip of the otherworldly, ridiculous vision that was — and still IS, actually — Jimi Hendrix? I was just a teenaged kid sitting in the back seat of a car with my brother driving us home and I remember hearing the song “Bold As Love” come on the radio. I was super into metal — loved Van Halen like no other (and still do of course) — but when that song came on the radio, I was practically clawing my way into the front seat, going, “OHHHH MY GOD … WHAT. IS. THATTTTT??!!" And you know what grabbed me most about Hendrix? it was his rhythm playing that got me. That was the first thing. I couldn’t have explained that at the time, of course. All I knew was that I was hearing something supernatural and alien, a combustion of sonic fury and melodic sorcery that made me want to jump out of my skull and run to my guitar. Anyway. I don’t remember how I found that exact CD — probably on the floor in a pile of CDs in a friend’s basement — but I did. And it led me to hearing the song, “Voodoo Child” in a movie and that was my second profound Hendrix moment. I can taste it again like it was yesterday … hearing that simple riff on the way-wah pedal … the song exploding into full sonic force … Hendrix crunching those chords with authority … embarking on those stratospheric, soaring leads that made him famous … and then the real explorations halfway through the song where that basic, thundering riff just slays you. Sigh. Is there any hope for a guitar student when he hears THAT?? Look, it’s true that not us, not you, not anyone else reading this right now could ever hope to approach the talent that was James Marshall Hendrix. We won't excuse you for not associating Jimi Hendrix with anything having to do with your own guitar playing. Totally. We get that. The "Hendrix Master Class Series"
Hear Hendrix in a whole new way. You'll be able to analyze WHAT he's doing and WHY. Raises your Guitar IQ by 20 points, minimum! Simple ways to get that Hendrix sound and spice up your 3 chord minor chord progressions. Discover how to use octaves to get exciting melodic ideas in both your rhythm and lead playing and use them to move your licks all over the neck. Learn to use unison bends as well as whole step and step-and-a-half bends and vibrato to add tension and feeling to your phrases. Learn to play simply but say a LOT! Learn the classic R&B style riffs that are essential to being able to use Hendrix's rhythm approach in your playing. Finally master how to mix major and minor pentatonic scales to get those cool notes that don't seen to fit in the common pentatonic boxes. Full-blooded custom jam track in the style of the Hendrix masterpiece, "Bold As Love." Upbeat, funky jam track in the style of the Chicago electric blues classic "Killing Floor." Instantly recognizable, intoxicating jam track inspired by the song, "Foxy Lady." Need we say more?! Tasty, textured jam track in the style of Hendrix's all-time epic "Manic Progression." Tasty jam track in the style of "All Along the Watchtower." You already know that Jimi Hendrix was one of the first mainstream artists who took blues and R & B and brought them all together into a modern context of rock and roll. But what you might not realize is that learning his style means that you’re learning all those styles into one. So that’s one reason to learn Hendrix: because it incorporates both rhythm AND lead into so many different styles. Meaning you don’t have to wade through a bunch of different artists to put all the pieces together. But there’s also this: Learning how Hendrix plays rhythm and lead means you can adapt it across everything else you do with guitar — no matter WHAT style. This is hard to explain with words on a page, but trust us when we tell you that when you HEAR yourself creating these amazing sounds, it means you’ve mastered certain movements and tendencies, which ultimately means you’ll be able to apply them to whatever other genres or styles you’re into. Mastering All This? This Is Hendrix, After All?!!" Sure, we hear you. But as great as his rhythm techniques and lead lines sound, learning the actual physical moves are simply not that difficult. At least not when you see how Brett has broken them down for you. Put another way: It’s HOW he put those chords and scales together that makes the Hendrix special sauce. He just did his thing, and that’s what you'll learn on these DVDs. about the heart and soul of it all? There’s no doubt that Hendrix was one of the only guys who could hit you on ALL levels. Is that teachable? Sure, of course we can’t know what’s in your heart. YOU have to supply that “inner” component. But you’ll see that the riffs are actually fairly simple. And when you learn how to attack the strings with bending, vibrato and other techniques, you’ll feel comfortable quickly, and your own soul (for lack of a better word) will naturally start kicking in to your playing. "Hendrix Master Class 4-DVD Set"
Wanna play rhythm like Jimi? Then watch this DVD as you learn how to incorporate the minor pentatonic scale in your own rhythm playing by using the different positions in the scale in conjunction with hammer-ons and pull-offs. And then to add melodic licks we'll chain the chords in the progression together. Sweet! You’ll also learn simple ways to get that Hendrix sound and spice up your 3 chord minor chord progressions. Finally, use octaves to get exciting melodic ideas in both your rhythm and lead playing and use them to move your lick all over the neck. Time to break out of the box! How to use unison bends as well as whole step and step and a half bends and vibrato to add tension and feeling to your phrases. Chain positions together to expand your usage of the fretboard and to give you more options when soloing. Use different techniques like position shifts, bending, octaves, vibrato, and traveling from high to low strings all in one area of the fretboard to make simple but exciting riffs the "Jimi way." Use easy chords with hammer-ons and pull-offs that follow the progression to make target note soloing a breeze; sound like you know what you are doing by just varying your picking hand technique to turn rhythm into lead playing. Learn riffs that use and chain every position in the pentatonic scale together. And additional material too extensive to list here! Learn to incorporate and understand all of the rhythm ideas used in Jimi's masterpiece. "Bold As Love." Learn the E, A, and D inversions off all of the chords to open up the fretboard in ways you never dreamed possible. Use the rhythm licks to open up and show you new ways to add tons of major pentatonic lead lines and how to become more melodic in your lead playing. Learn to solo in the dreaded major pentatonic scale and how to easily understand how to use it by learning to see the chords in the scale positions. Concentrates on melody and seeing target notes to effortlessly create the same memorable lead lines that Jimi was famous for. Learn to mix major and minor pentatonic scales to get those cool notes that don't seen to fit in the common pentatonic boxes. In the final lick on this DVD we learn all-out pentatonic madness by using both major and minor pentatonic scales as well as how to apply chromatic runs in your lead lines to take your playing to the next level. Here Brett shows you how to play a song in the exact style of Jimi's epic song, "Manic Depression." You'll also learn how to play in different time signatures and how to add that "swing feel" to your playing. Not only that, but you're also going to learn how to use scales, chords, and the infamous "Hendrix Chord" together to write killer riff-based rhythms that you can use in your songs. Awesome! How to weave in and out of lead and rhythm playing so that you can be playing lead and then effortlessly come back to rhythm parts to lock in the hits with the band and then get right back to the leads before the listener ever knew what happened. Lots of sliding riffs and unison bends to add flavor and tension to add emotion to your solos. Tons of great first position bending and hammer-on and pull-off licks. A music critic once described Jimi's classic "Foxy Lady" like this: "If one song could be said to encapsulate Hendrix’s entire oeuvre, 'Foxy Lady' is certainly closer than most." And that's why Brett used this song as Brett's inspiration in this module. You're going to master how to write riffs in this amazing style, and you'll also learn to develop picking accuracy by jumping from low to high to middle strings in one passage. The importance of right and left hand muting. How to take a pentatonic position and a couple of chords and write an entire song. Learn the importance of right and left hand muting. Learn cool and unique sliding and bending riffs totally unique to Jimi. Learn how to add other scale tones and half note bends to your lead lines to get that mystical Jimi sound found in many of his solos. We ain't done yet! On this DVD we'll be carrying on with the theme of riff-based rhythm pentatonic playing by learning some of the concepts used in the amazing Jimi track, "Killing Floor." By doing this, you'll learn how to tighten up your rhythm chops by add syncopated funk style riffs add double stop runs in your lead riffs. You'll be blown away by how this sounds coming out of your guitar! We'll also take everything we've learned so far and turn it up a notch. What do we mean by that? Well, it means Brett is going to give you challenging but rewarding riffs that, once learned, will give you more confidence in your rhythm and lead playing. This is HUGE. You'll immediately see the benefits carry over to ALL aspects of your guitar playing. Finally, we'll finish things off by giving you some more challenging syncopated rhythmic riffs that we'll need for future Jimi lessons to come! For those of who who REALLY want to dial in that Hendrix sound with even more precision, Brett has created a whole separate lesson module on gear for you! He will literally show you all the gear he uses to get the sounds in this lesson series. And Brett also gives you examples on how to achieve some of those classic Jimi tones on your own. Whether it's employing different pedals and amps, Papastache shows you how to get it done, "from cheap to boutique" to cover all budgets. It will help get you one step closer to that Jimi sound! YES , I want it! 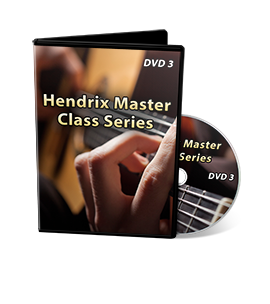 Please let me have your brand new 4-DVD sets of the “Hendrix Master Class Series” for just 379.99 $129.00. I understand this is a limited time offer that is expiring at the time and date listed on this page. Get started rocking out today, we cannot wait to hear about your progress! Look, there is no better legend to study than Hendrix. Not only did he create some of the coolest-sounding and most groundbreaking blues-rock guitar music in history, but learning these techniques will apply to ALL of your playing. This is a comprehensive package. Hendrix is the perfect guy to learn because he incorporates rhythm AND lead into many styles --- which means you don't have to go through a bunch of different artists to put all the pieces together. You’ll amaze yourself with the new sounds coming from your guitar. You’ll now have a firm grasp on all the essentials you’ll ever need to go as far as you want. And you’ll naturally understand how to fuse rhythm AND lead together in a way that few others do. Take advantage of this special re-launch price and let’s do this! P.S. Why Brett Papa and why Hendrix? Well, Brett is quite well-known for teaching Hendrix, actually. He's been told over and over again that he has a knack for breaking Hendrix down in a way that other can’t. Plus, he's always been the hugest fan, which is why he's learned so many of his songs. Trust us, you'll HEAR the "Papastache passion" in these lessons! 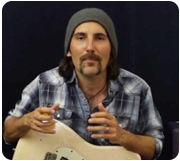 And keep in mind that he doesn't just break down songs — Brett teaches you how to incorporate his style so that you can apply it in your own playing. That’s huge. P.P.S. For those of you familiar with Brett's work online, please know that everything he's ever posted online to this point about Hendrix has just been piecemeal stuff. Never before did he sit down and film a complete, comprehensive lesson program on just Hendrix. And that's exactly what he's done here.